Fran rowing home in two-seat the day we won our Blades last term. Look at those braids. Photo credit: Giorgio Divitini, a student photographer from Churchill College. 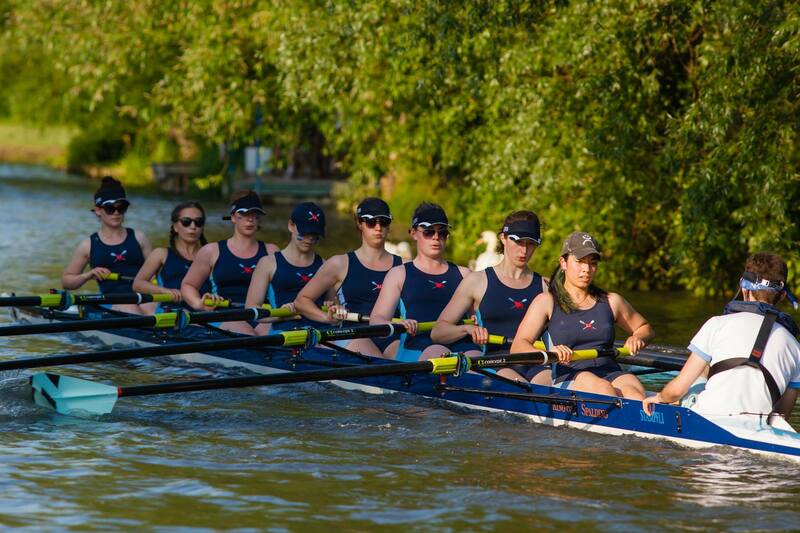 Here follows Courtney Landers’s eleventh and final part of her diary about how she and her team mates in Pembroke College BC’s W1 prepared for May Bumps on the River Cam. 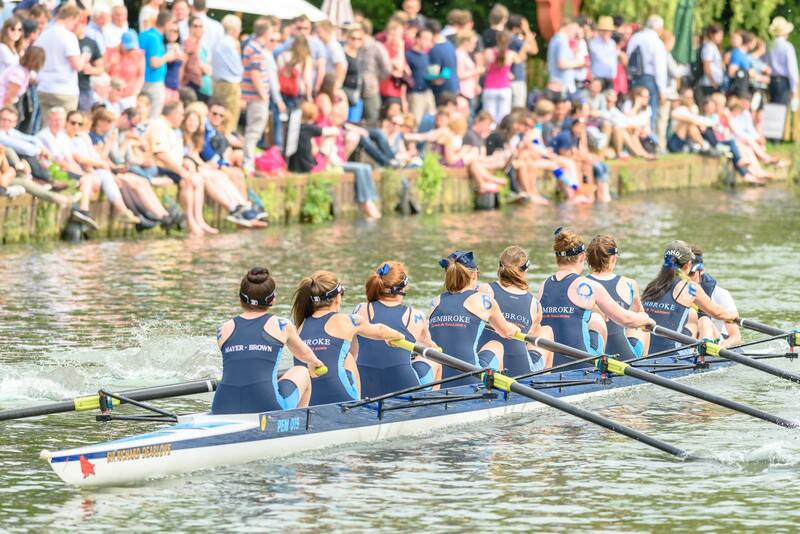 We say in Cambridge that ‘anything can happen in Bumps’, and this year it really did. Ideally this week would have been quite short, along the lines of ‘we came, we saw, we conquered’, but it didn’t turn out like that. Our adventures are quite a good example of the drama and excitement of Bumps, so forgive me for the super-long length. I’ll start by filling in some details I rather sneakily omitted in order not to tip off our competition; the last week before Bumps involved a little more drama than we would have liked. 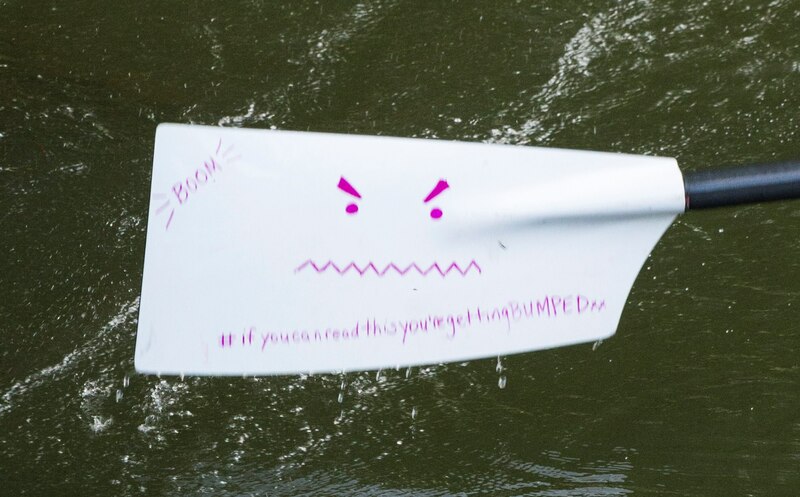 Injuries are quite common in college crews because Cambridge students aren’t known for taking care of themselves, and our often hectic schedules don’t allow for a lot of rest and recovery. My pair-partner Emma is so accident-prone we joke that if it’s possible to hurt yourself on something then Emma will, our bow-seat Katharine had quite a bit of pain in the last fortnight caused by her hench quads pulling her knee out of line, and all of us managed to bleed on the boat at some point in term. 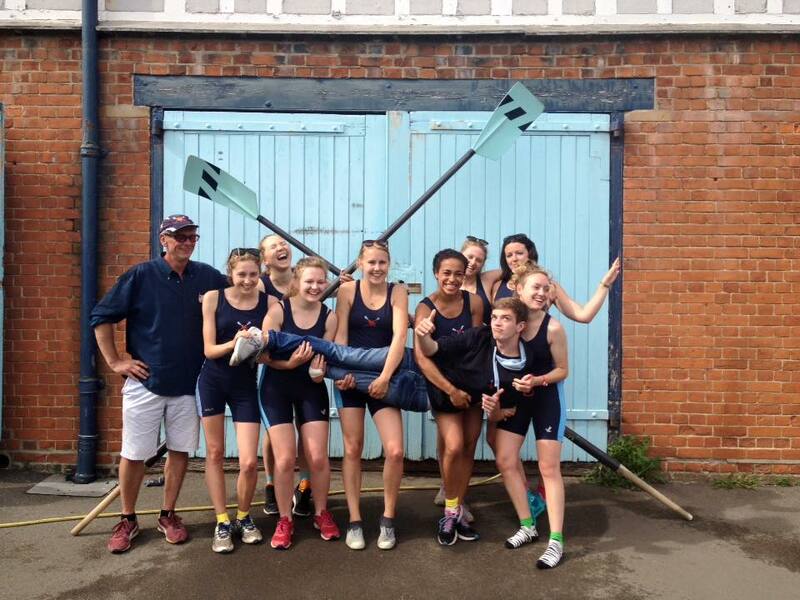 However, it was still a shock when in the last week of training one of our girls acquired an injury that removed her from the boat for the remainder of term, including Bumps. When something removes one of our women from a boat, we fall back on the squad nature of the women’s side. 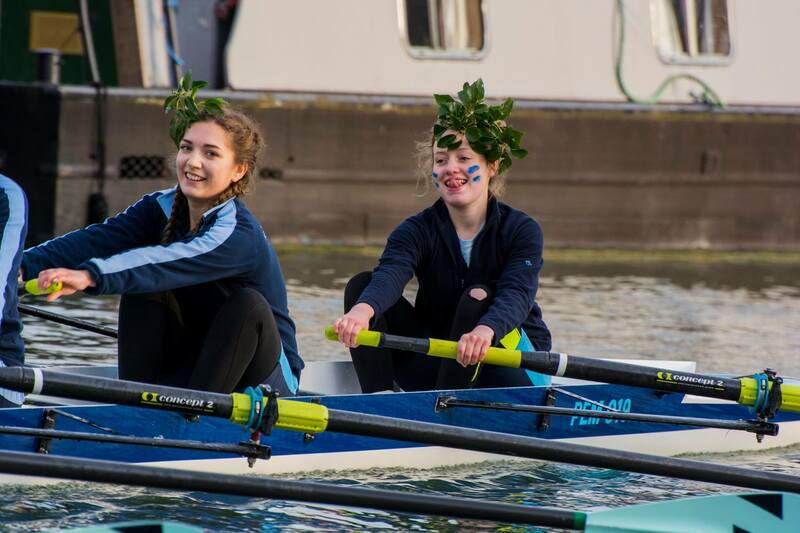 At Pembroke we train and compete in set boats from the start of term, but we are essentially one big team. Standard practice is that someone from the second boat will be selected to fill the place in the first boat, someone from the third boat will move up to the second, and so on. When the unexpected happens early in the term crews have plenty of time to train together and adjust to their new members so performance isn’t likely to be affected, but the closer to a race you get the harder it’s going to be for crews affected to adjust in time. 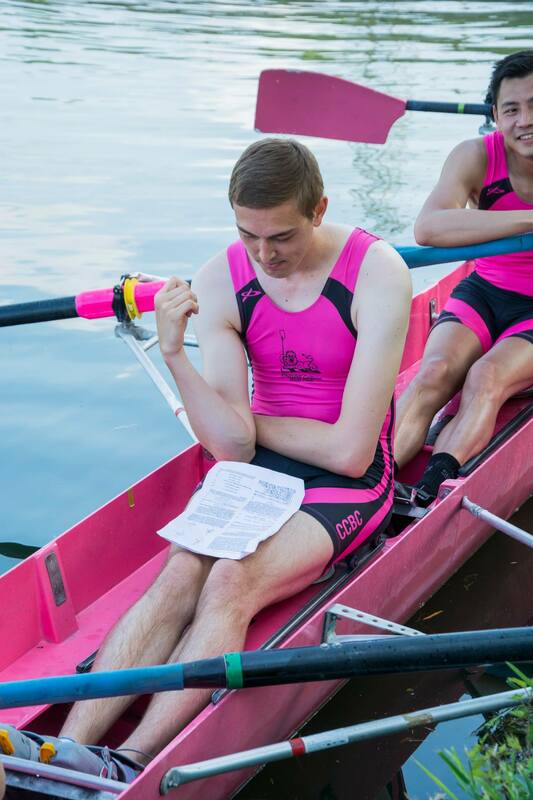 Last year in Michaelmas term I was swapped into W1 from W2 just two weeks before the Fairbairn Cup, and I felt very conflicted; I was thrilled to be offered my first chance to train and compete with W1, but we’d worked really hard as a W2 crew all term and I felt like I was abandoning them. Our W2 this entire year has been so, so strong. Having gone up three places with that crew in both Lents and Mays last year, I was excited to see what they could do this year, and in Lent they went up three again. This term they’ve been clocking up head race times that made them the fastest or second-fastest W2 on the river, and consistently beating W1 boats from other colleges. They’ve also been a very tight, closely bonded crew. So when we had to take a sub from W2 just a week out from Bumps I felt quite guilty, but also incredibly grateful. We owe them our bumps, really. We also owe a debt to our W4 Champagne boat because the sub for W2 – one of our lower boats captains – came from their ranks. Combined with several members having exams on the day of the Getting On race this left W4 with no option but to row for time only with subs including alumni, ending their bumps campaign. W2 and their coach on the last day of Bumps. Now that I’ve given my thanks, allow me to introduce the final member of our crew, our two-seat Frances. 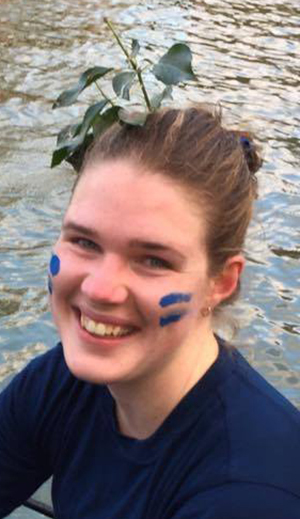 Fran is a second-year English student who also rowed at two in the W1 crew that got Blades last term in Lents. In addition to having the loveliest English accent my uncultured Australian ears have ever heard, Fran is in possession of some kind of dark magic that keeps her hair impeccable no matter what rowing throws at her. 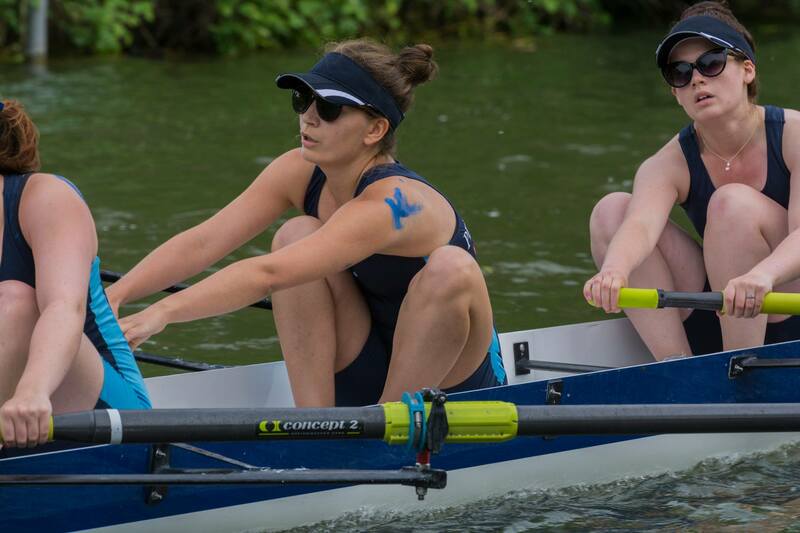 Fran has also been our Social Secretary this year, which meant this term she had to figure out how to deal with the unprecedented event of two Pembroke College Masters attending Boat Club Dinner. Our current Master Lord Chris Smith was joined by our last Master and current President of the Boat Club Sir Richard Dearlove. Normally the Master is seated at the head of the main table, but with two Masters what do you do? If you’re Fran, you seat Lord Smith at the head of one table and Sir Richard at the head of another, and a diplomatic incident is avoided. 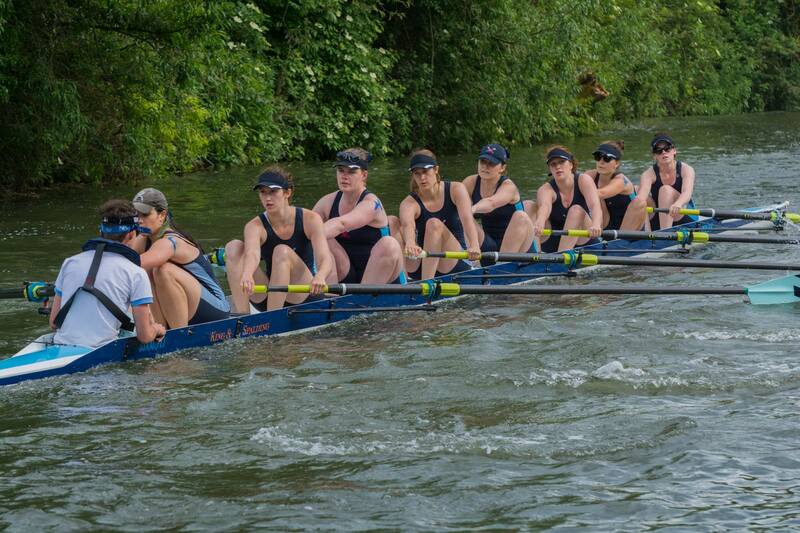 Fran looking incredibly composed on the last day of Bumps. Photo: Giorgio Divitini. With Fran on board we completed our final training sessions, visualised our race plan at our Bumps-eve crew dinner, and headed out to chase Lady Margaret Boat Club (LMBC) W1 on day one, Wednesday, wearing matching unicorn-print socks. The first day is always the hardest; you don’t want to be cocky and assume you’re going to make a bump, but you also want to hype yourself up enough so you have enough confidence to go after the bump. Being in the middle of several strong crews added extra tension because we knew if we were to catch LMBC it would be a long row, and the whole time Churchill College Boat Club W1 would be trying to catch us. W1 rowing up to our starting position on day one looking cool, calm and ready to rumble. The swans and cygnets in the background are of the friendly kind. Photo: Qty Photography. When the cannons went our start was on point and we shot off down First Post Reach and gunned it round the corner. It was probably the calmest, most focussed rowing we’ve ever done. Unfortunately, it wasn’t enough, because after a long fight we were bumped by Churchill near the Railway bridge, ¾ of the way through the race. W1 rounding Grassy Corner on Day One. Photo: Matevž Poljanc, Pembroke student and member of PCBC’s M3 boat for Mays. We made it far from easy for them to claim the bump. Once racing crews get past Grassy Corner contact between boats is required to clinch a bump, whereas before that point bow-ball-past-cox is a bump. Some tricky steering on James’s part forced thus forced Churchill to achieve enough overlap that Audrey at stroke could have reached out and touched their bow ball by the time they hit us. 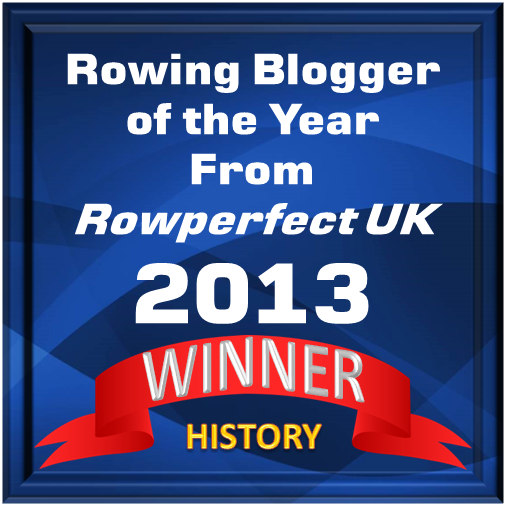 So while we were disappointed that we’d been bumped, we were quite proud of our row – Audrey in particular stated that was ‘the hardest we’ve ever rowed’. In fact, it’s the most cheerful I’ve ever seen a crew after being bumped. That didn’t stop us vowing to charge back at Churchill and deprive them of the chance for Blades. In the end however, our real fight on day two was against Jesus. Chasing us on day two was Jesus College Boat Club’s W2. JCBC is historically a very strong women’s side and their W2 is no exception – they made it into the first division by winning Blades last Mays. The Mays prior to that they overbumped my W2 boat on the first day, which was also my first day ever rowing Bumps. That was also the first time Sir Richard Dearlove, Master of Pembroke at the time, had come to bank party a race I’d been in, and I can still remember his voice booming at us as Jesus charged in for the kill. I was not about to get bumped by that boat again. Winding down after a practice start on our way to starting station, day two. Photo: Matevž Poljanc. We didn’t manage to gain on Churchill, but we probably would have ended up rowing over – not bumping or being bumped – fairly comfortably had it not been for some very surprising carnage. All was going well until as we came past the Plough Pub cox James suddenly started screaming ‘clear the line’ at Churchill. Unbeknownst to us the boats in a bump ahead of us had failed to get out of the way properly, and both LMBC and Churchill had been caught behind them and forced to also stop mid-river. 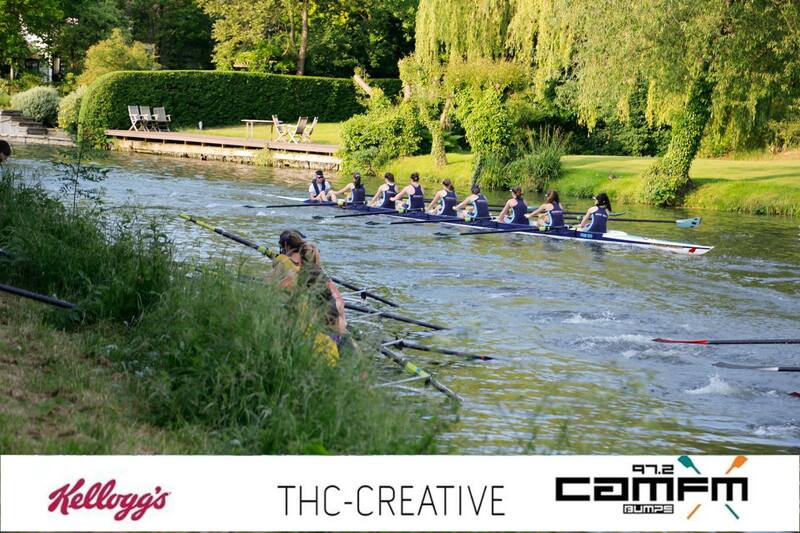 As we approached Ditton Corner, about halfway into the race, Churchill was sitting at a 45 degree angle in the river! Approaching Ditton Corner on day two – you can see the blades of Churchill in the bottom right corner. Photo: CamFM. James told us after the race he thought we were going to have to stop as well, but he managed to steer us past Churchill on the outside of the bend. With clear water ahead we should have had an easy row-over, but going wide round the corner had given Jesus behind us almost a length’s advantage – by the time they went through Ditton, Churchill had cleared and Jesus could take the racing line. Thus what happened next was a row over with Jesus sitting between half a length and a canvas away from our bow. The entire thing was filmed by William Connolley – watching afterwards I particularly enjoyed that you can hear James screaming at Churchill in one breath and going back to calming calling strokes in the next! If you watch carefully you can also see the ‘oh hell no’ moment at about 6:20 where we collectively realised what was happening and started pulling power tens. Thus the last kilometre was a dead sprint. In the words of stroke Audrey ‘That was worse than yesterday’. Day three we got another chance at LMBC. They and Churchill were given a re-row after being forced to stop behind the carnage, and Churchill bumped LMBC putting them in front of us for the next day. Sadly, despite pulling out probably the most aggressive start of our entire week, we only made two whistles on LMBC before Churchill bumped Christs in front of them and LMBC sprinted out into clear water. However, some of my favourite photos from the whole week come from that Friday. Made you look, LMBC. Photo: Matevž Poljanc. I’ve never seen James that colour before. Photo: Giorgio Divitini. We realised by the final day that though bumps weren’t going quite the way we wanted, we were providing a lot of entertainment. Day one was described by our spectators as ‘the gutsiest row we’ve ever seen’ and on day two significant levels of stress occurred because no-one knew whether Jesus had managed to bump us – there were rowers hanging out the windows of the boathouse waiting to find out when we got back. Later that day it was also wrongly reported that we were overbumped by Peterhouse. By day three, the number of people keen to bank party us was double the allowed quota. So we were rowing over, but we were doing it in dramatic enough fashion that William Connelley had tracked us down the river each day. Thus on the final day we did two things. Firstly, we spelled out ‘Pembroke’ down the crew using blue face paint (we suggested James paint his face Braveheart style but cox superstitions state shaving is not allowed during Bumps so the stubble got in the way of the paint). Showing some college pride on the final day. The ‘K’ on Marianna’s shoulder has been mostly washed away – Audrey is a splasher. Photo: Jonathan Furhmann. Second, we decided to go for a ‘fly or die’ – go out as hard as possible to try and catch LMBC at the risk of getting to the reach and running out of gas. We figured we’d put enough distance between Jesus and ourselves in the process that we could then just row over if we blew up or LMBC bumped out. Obligatory picture of me pulling my usual rowing gurn – seemed fair to embarrass myself after using photos of everyone else. Photo: Giorgio Divitini. Though we went very fast, we did not manage to catch LMBC before they bumped Christs. We rowed over with Jesus making a last-ditch effort behind us – in this video you can hear their bank party giving them some very optimistic whistles. Overall it was a true ‘bumps bumps’. Plenty of carnage and drama to be had. We’re quite happy with how we did on the whole – essentially Churchill were moving up and everyone around shifted places as a result. Had Bumps lasted one more day we would have bumped Christs to be back in the same position we started in. In conclusion, we trained hard, we rowed hard, and that’s all we could have asked for. Probably my favourite photo from the whole week, mainly because I’m not pulling a face. Photo: Giorgio Divitini. 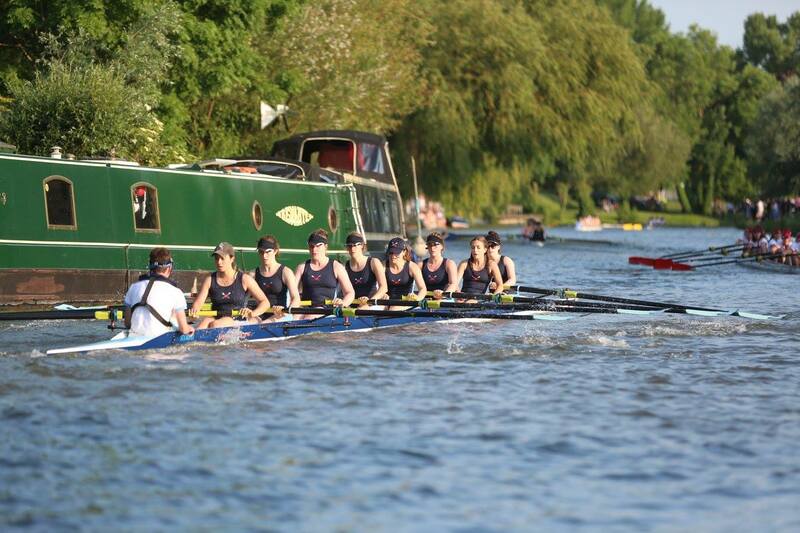 It seems only fair to give our other Pembroke crews some love, so as briefly as possible here’s how their bumps went. Our M1 put their hearts and souls into their valiant attempt at the headship this year. They nearly caught Caius on the first day, only to be caught by LMBC mere strokes from the finish line. They charged after LMBC on every day after; some say LMBC unexpectedly took the headship from Caius on the final day simply because they were trying so hard to get away from Pembroke. If you’d like to see what a Headship bump looks like, you can find that video here. 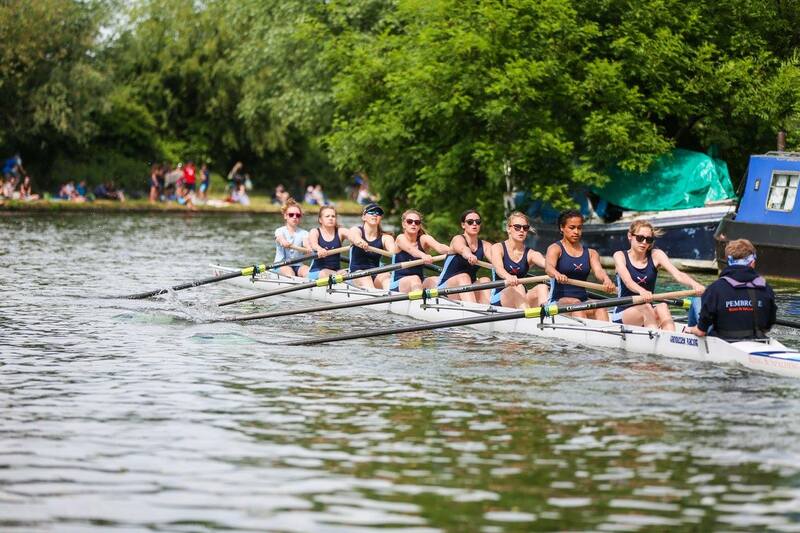 W2 had their very likely bump on Darwin W1 snatched away on the first day when Homerton W1 crashed just after the start – Darwin had only to row past and pull in for a bump. Homerton bumped Darwin back on the next day, but it was too late for W2 who were left at the mercy of Newnham W2, Robinson W1 and Lucy Cavendish/Hughes Hall Combined W1, who all went up three or in Robinson’s case got blades. W2 tearing up the water in a practice start on day four. Photo: Matevž Poljanc. 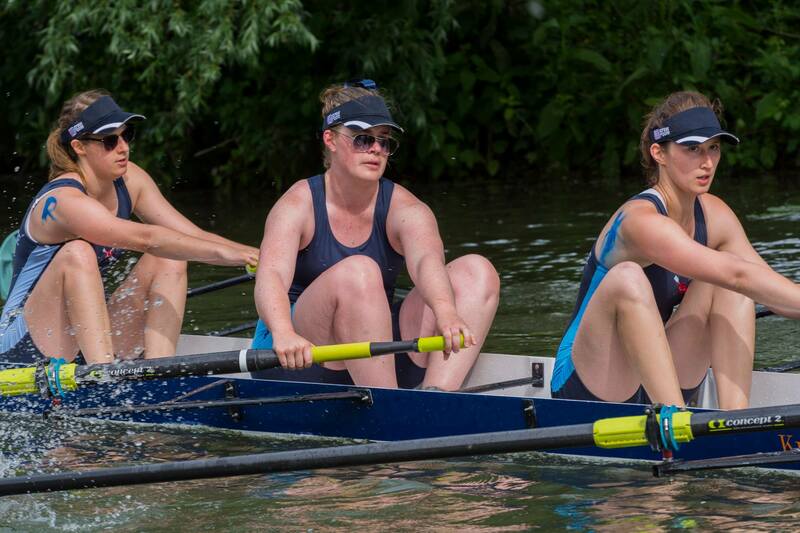 Our W3 women had a very successful four days, bumping up three places in total. 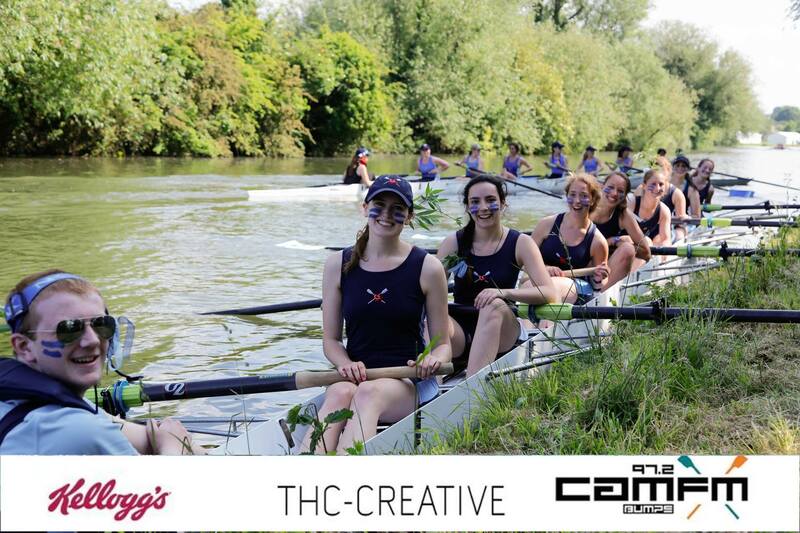 Their first bump was the Anglia Ruskin Boat Club W1, which they should be very proud of! 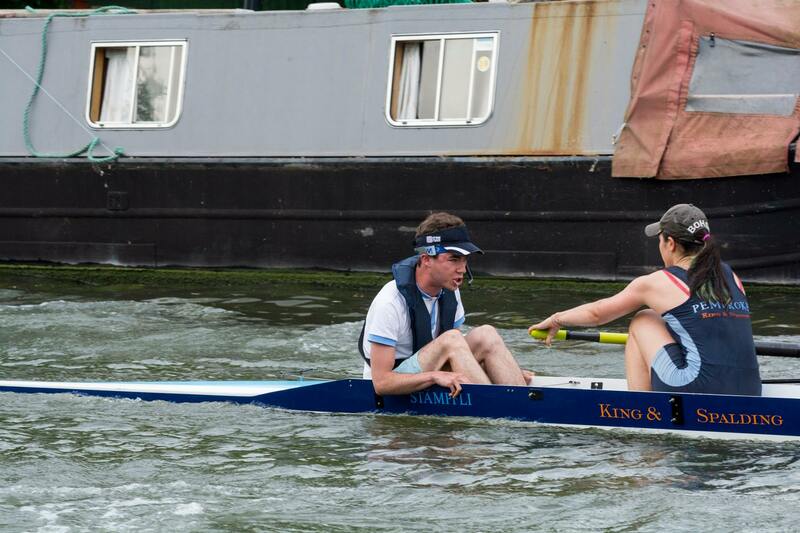 An interesting tidbit: ARU are the only non-Cambridge University-based Boat Club allowed to compete in Bumps. Aside from them the only entries allowed outside College boat clubs are from Addenbrooke’s Students Boat Club (our med students), the Vet School Boat Club, and the Theological Colleges Boat Club. W3 looking adorable after their bump on day two. Photo: CamFM. M3 earned Blades in spectacular fashion. To begin with on day two they bumped twice; they bumped Queens M4 to become the ‘sandwich boat’ at the top of division M5, meaning they rowed again at the bottom of the M4 division, where they bumped Selwyn M3 to cement a place in the M4 division. 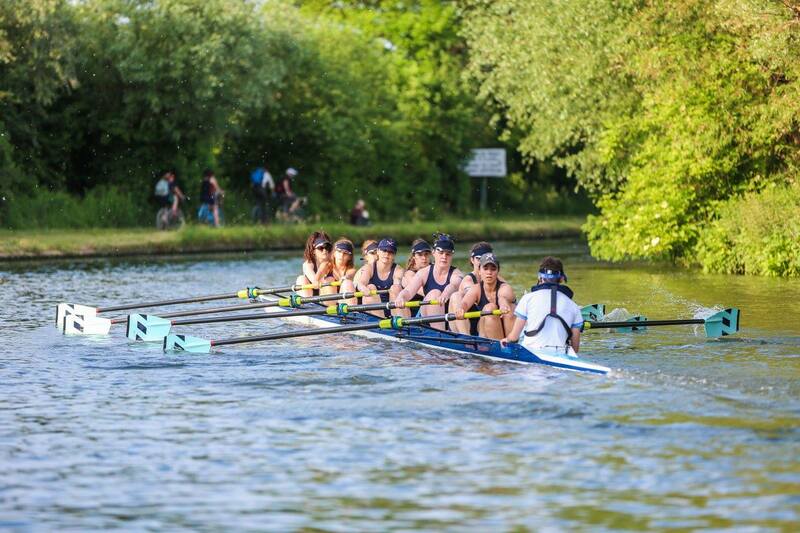 On the third day, they bumped again, but that day Queens M4 had bumped into sandwich boat position and were rowing behind them; once Pembroke bumped and cleared the river Queens charged ahead and overbumped Downing M3 right before the finish line. Meaning that on the final day as they attempted to get their Blades our M3 found themselves chasing Queens M4 again! The majority of their division was given technical row-overs after carnage stopped the race early on – there are no re-rows on the final day – but M3 managed to bump Queens before that happened. They thus earned their Blades by Bumping up five places and bumping the same crew twice! Queens record all their races, so if you’re interested you can see the Pembroke vs Queens races here and here. And finally the Pemgibeers went up two. Not quite the blades they were hoping for, but a good result all the same. As a reward for reading all that, here are some additional photos of the colourful characters of Bumps. 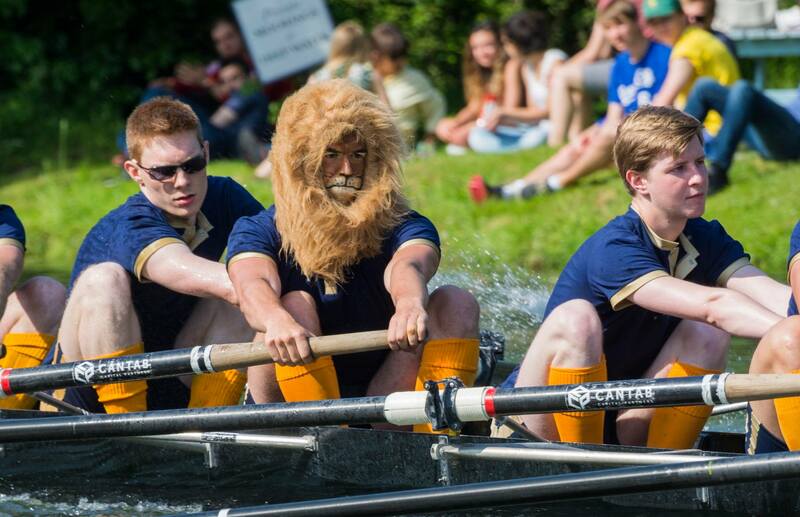 A member of First and Third Boat Club gets into the spirit of things. Photo: Giorgio Divitini. 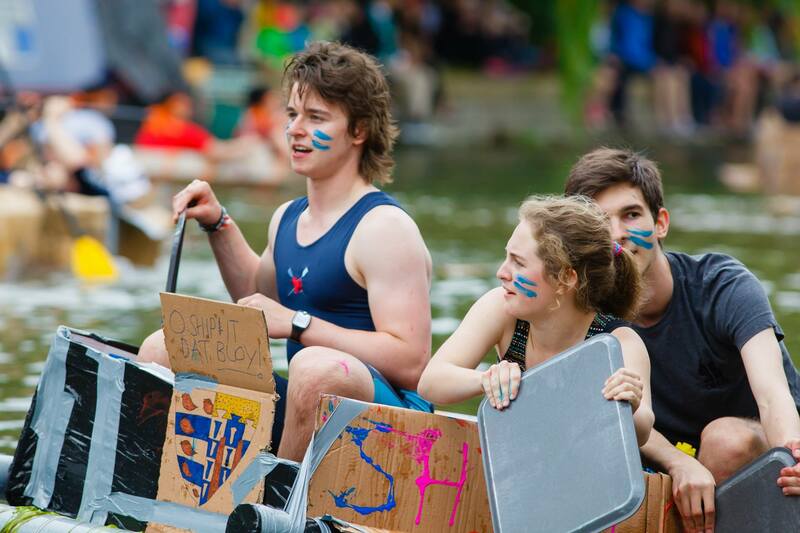 May Bumps and the final week of exams overlap – this rower is clearly dedicated to the cause. Photo: Giorgio Divitini. Churchill’s women have pink blades, but one is white for some reason – one cheeky rower has drawn a smiley face on the front. This appeared on the back this year. A member of PCBC participating in another great Cambridge tradition, the Cardboard Boat Race. Photo: Qty Photography. Thanks for the blog(s), and I’m glad you liked the videos. I hope I didn’t say anything incautious on the audio.